Louis P. Hammett Mitchill Professor Emeritus of Chemistry, Columbia University My interest in linear free energy relationships began when, just out of graduate school, I read in 1924 the article by Bmnsted and Pedersen which for the first time reported the existence of such a relationship. That interest continues to be an active one and, to judge merely by the extensive biblio- graphies contained in the present volume, it is widely shared. 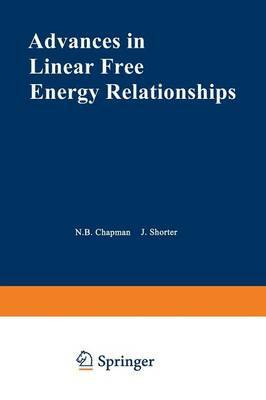 To my mind a particularly happy aspect of the existence of linear free energy relationships has been the proof it supplies that one need not suppose that the behavior of nature is hopelessly complicated merely because one cannot find a theoretical reason for supposing it to be otherwise. The effect of a substituent in an organic molecule on rate or equilibrium of reaction involves a fourfold difference between relatively large quantities, a situation which always makes for difficult theory. Yet systematic organic chemistry could hardly have existed were it not true that like changes in structure lead to like changes in reactivity. Linear free energy relationships constitute the quantitative specialisation of this fundamental principle, and they stand indeed more in the office of teacher to theory than in that of learner from it.